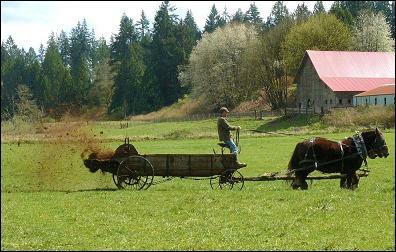 Ryan Foxley spreading manure with his team in April, 2010, on his farm outside Arlington, WA. He uses true horsepower for his various on-farm power needs, and those horses provide the additional benefit of manure and compost for the fields. Ryan is spreading with an 80-year-old New Idea spreader. Click here to read his Littlefield Blog, or check out his recent columns in the Small Farmer’s Journal. Now that we know something about how to make compost, and what compost can do for the soil, the next question is: how and when to apply it? The short answer is: it depends. Let’s take a look at the variables that go into determining that answer. The first question of how best to apply compost is relatively simple. Most folks apply it directly to the soils, either during the pre-planting stage for crops, or right after cutting/grazing for hay and pasture crops. For small growing areas, finished compost can be wheeled about in carts or wheelbarrows and either shoveled or dumped into growing areas, then spread more evenly with a rake. For larger areas, some folks will use either a front end loader or powered carts to deliver larger volumes, then spread the compost either by hand or with a scraper attachment for a tractor. For larger areas growers can use either a wagon to bring the compost out to the field, then shovel it out a bit at a time, or they can use a manure spreader, which both carries the compost out to the field, and spreads it behind the tractor as the combo crosses the field. All these options give growers quite a few options according to their own particular needs and areas. The question of how much to spread is a bit more involved. We can take the specific or general route. The specific route involves testing both the soils and the compost to see what the former needs, and what the latter has to offer. That testing is a very good idea when first working with either new land or a new composting setup. We simply cannot tell by appearance, by touch or by circumstance what’s really going on with either soil or compost until we’ve had a tremendous amount of practice. If working with a new parcel or a new compost operation, we haven’t had that practice yet. Hence the testing. Testing labs are relatively straightforward to work with, but each of them has their own particular criteria. I’ve listed some regional testing labs at the end of this blog, but you may also want to contact your nearest Extension office or Conservation District to get a list of the labs they recommend. Typically test samples are relatively easy to gather and submit, but the cost will vary according to how much testing is done on the samples. Many labs will handle both soil testing and compost testing, but be sure to confirm that before submitting any samples. Most labs have sample submission guidelines either posted on their website, and/or they can send those guidelines upon request. I’ve provided some links at the end of this blog for how to best gather samples, not only in terms of actually gathering the samples but also in terms of how to cost effectively choose the type and number of tests to run. Once the testing is done, the labs will provide a printout of all the criteria found in the submitted samples, along with recommendations for how to remedy any deficiencies or surpluses. Here is where we move even further away from conventional agricultural treatment and deeper into the realm of sustainable agriculture. Why is that? Because this is the moment when we consider not only this year’s soil fertility needs, but also the soil’s fertility needs for years and even decades to come. As we’ve already seen, some soil nutrients such as nitrogen are extremely mobile, moving through the soil via water, and/or evaporating into the air. We’ve also seen how other nutrients may be present in the soil, but are inaccessible to plants due to chemical or physical bonds with each other and/or with the inorganic components of the soil itself. Those who are primarily interested only in feeding this year’s crop have become very adept at using quick-release or seasonal-release formulations for nitrogen, phosphorus and other nutrients to give this year’s crop exactly what it needs, exactly when it needs it. From one point of view that’s extremely cost-effective. But from a long-term point of view, over the passage of time that only creates a soil that has no reserve of fertility. Additionally, many micro-nutrients are never measured, let alone added. So the soils end the season more impoverished than they began. That might not add up to much change after a few years. But the longer that pattern holds, the more impoverished the soils become and the harder it will be to get them back into being generally fertile again. Some soils are so bereft of both nutrients and organic matter that they are nearly lifeless. Other civilizations have worn out their soils in this manner, and their national wealth suffered as a result. We may want to take a long hard look at where that pattern is leading us. Conversely, the application of compost can be both cost-effective and provide an investment not only in this year’s production, but also improve soils for years to come. Why is that? Recall that compost is not merely providing nutrients; it also provides a rich web of once-living materials which are in various states of decay. Those materials are accompanied by the microorganisms that are busy consuming those materials and freeing up the elements which built them. That process only starts in the compost pile; the actual lifespan of that process can be measured in years. So as those hungry little beasties continue their consumption, new elements are continuously released into the soils, renewing the soil’s reserve for those nutrients. Furthermore, the very presence of those microorganisms will also improve the recycling of whatever other materials are also present - crop residues, urines and manures applied via grazing, and even additional non-compost soil amendments. Hence the term “slow release fertility”, because those nutrients are released slowly but surely over the passage of time, regardless of what is actually being grown or how the soils are being cultivated. Applying compost, then, is truly an investment not only in this year’s growth, but even moreso in future growth. So we return now to the question of how much compost to apply. If soil and/or compost testing was done, a good starting point would be to figure out which of the macronutrients (typically nitrogen) is in greatest need, and apply a measured amount of compost to meet that need. However, that recommendation comes with a very big cautionary note. Because no one soil is perfectly balanced, and because any given compost comes with a very wide variety of nutrients, it is unlikely that a single application of compost will meet every criteria needed by the soil. More than likely, the compost will provide too much of X and not enough of Y nutrient. Additionally, compost by itself may not be sufficient; the soil may need other amendments to change undesirable characteristics. A prime example would be if the soils are slightly to severely acidic due to moderate to heavy rainfall. Sure compost will help that, but you’d have to apply mountains of compost to make the necessary changes when a minor application of lime would accomplish the same task. As wonderful as compost is, it can’t do everything. Particularly if your soils are acidic, but generally if your soils need something which the compost can’t provide, don’t be afraid to supplement the compost with other ingredients. Another example would be if fields need a tremendous amount of nitrogen. The temptation would be to pour on the compost, but that might introduce other surpluses or deficiencies in other nutrients. Bottom line, many folks want to apply enough compost that their manure piles go away and/or their compost bins are empty. The better yardstick is to apply as much compost to the soils as is beneficial, but use the soil’s needs as the guide. If you have compost left over, consider that money in the bank, or even a product to be sold. More compost on the soil than what is needed is wasteful. So far we’ve talked about working from lab results for both the soil and the compost. What if you don’t have those lab reports? There are generalized recommendations for how much to apply, but they vary a lot. For croplands where the compost is going to be worked into the soil prior to planting, many regional authorities recommend applying either a concentrated band alongside row crops, or a blanket over whole beds varying from ½ inch to 3 inches deep. Most authorities warn against applying deep volumes of compost, because of both the risk of nutrient runoff and diminishing returns. Those greater depths would only be appropriate in cases of extremely sandy soils in desperate need of organic content. In those cases, incorporation prior to planting would be ideal. For pasture lands where the compost will not be worked into the soil, the recommendation is for no more than ½ inch of compost. This helps ensure that the application won’t smother the plants underneath. Most authorities recommend applying compost in late spring after the soils have come up in temperature, so that the microorganisms will have good environmental conditions in which to live, and as much growing season as possible before the return of cold weather. If either the soil report or general conditions warrant heavier applications, the general recommendation is to stick to that ½ inch depth, but make several applications spread out through the growing season. Mid spring, summer and early fall would be three good times to spread compost and still reap some benefit from doing so. Compost should generally not be applied after early autumn, because there’s too little growing season left to make use of the more mobile nutrients, and those nutrients would then be washed away with winter precipitation. One exception would be to apply and work in compost just head of an autumn planting or flush of new growth, such as what happens when autumn rains drive new growth on pastures. Compost can be very well timed at that late date, if the nitrogen and other mobile nutrients can be taken up by that flurry of new activity before winter sets in. Before we leave this topic of how much and how often, let’s look for a moment at each compost application’s longevity. As we mentioned above, the total composting process actually takes years to play out. So to extend that thought, applying a single load of compost during Year 1 would actually benefit the soil for at least several years to come, right? It turns out that’s exactly what happens. Both traditional wisdom and recent experimental data confirms that a single application of compost will provide measurable benefits for 3-5 years. Furthermore, quite a bit of research indicates that the biggest flush of soil improvement won’t happen during the first year, but instead will take place in the second and even third year after application. This again has some nice implications for the long-term health of the soils, and the grower’s wallet. If managing fields for long-term sustainable growth, growers don’t need to apply compost every single year. They can get by with applying every other year or even every third year, and still keep the momentum going from past improvements. For particularly worn out or infertile soils, compost applications might be warranted once a year for the first 3-5 years or so, but after that the growers could still drop back to applying compost once every few years. Not only does this mean fewer trips across the garden or landscape, but it provides some scheduling opportunities for other amendments. For instance, we have issues here with acidic soils due to our high rainfall. I know of some growers who use a three-year model, such that they apply lime the first year, compost the second year, then rock dust or other amendments the third year. Or perhaps they weave a cover crop into the mix at some point and push the amendment schedule out even further. Then they repeat the cycle. That means they don’t have to provide all these amendments to every field, every year. Gardeners can do the same thing with different garden areas or growing beds. We’ve used something like this for a number of years here, where we’ll apply lime one year, compost next year, wood ashes from our woodstove the third year, raked up leaves the fourth year, then alfalfa mulch or cover crops the following year. The possible variations are nearly endless, and are limited only by the materials on hand, the state of the soil at any given time, the planting and cultivation schedule and the production goals for any given planting bed or field. The main point to be taken from this is not to drive yourself crazy with the possibilities, but rather to consider compost as one valuable tool within a toolbox of other soil fertility options. Use them all, in varying ways and times, to round out your soil fertility needs. 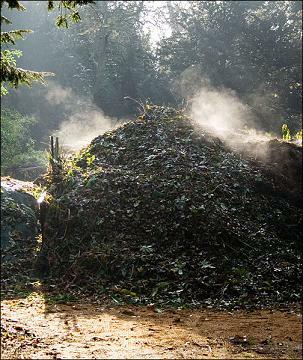 A steaming compost pile at St. Michael’s College in Colchester, VT. Proof that composting is not merely a gardener or farmer activity. This college and others like it are making dedicated efforts to divert cafeteria food wastes away from the landfills, and instead channel those wastes into productive new substances. Check out St. Michael’s composting page for more information. Our last blog entry introduced the process of composting, along with some preliminary information about composting ingredients, the C:N ratio, particle size, moisture, process time/temperature, and common pile shapes/sizes. That could all be considered the first half of composting. But what about when the finished product is put onto the land? How does it work as a soil amendment? Can it be called a fertilizer? What other benefits does it provide? How is it different from inorganic fertilizers? These application questions will be today’s topic. So, let’s say you have created a three-bin format composting setup. You have taken reasonable steps to ensure the desired 30:1 carbon:nitrogen ratio, appropriate moisture content and particle size for your feedstock, you’ve monitored the temperatures over time, and you now have a bin full of finished compost ready for application. What are the current recommendations for how to use, and how NOT to use, that black gold? First, let’s consider what compost actually does for soil. Strictly speaking, compost is not considered a fertilizer for the soil. Yes, it does contain nutrients, but that is not its primary function. Instead, compost is a soil amendment, or what some would call a soil conditioner. That’s because its primary function is to improve the overall biological, chemical and physical conditions of the soil, rather than merely adding more of this-or-that specific nutrient. And how does compost make these fundamental changes? As it turns out, in several ways. First, it inoculates the soil with a tremendous volume of living microorganisms. Soil should never be thought of as an inert physical substance, with only some chemical qualities to be considered. Much of conventional writing about soil will freely discuss the need for this-or-that nutrient, treating soil as little more than a matrix for delivering that nutrient. That mentality borders on treating soil-based agriculture like hydroponics. I have a tremendous respect for hydroponics, and we use hydroponics here for various crops. The basic premise of hydroponics is to work with a soil-less, inert growing medium which merely provides a three dimensional substrate to support roots and deliver nutrient in measured amounts. But if we are working with soil, my goodness let’s treat it with the respect it deserves. Soil is so much more than a three dimensional matrix for supporting roots and delivering nutrients. It is a microscopic urban metroplex teeming with life of various sizes and purposes. That life can work for us, or against us, in our quest to raise and harvest profitable crops, depending on how we treat the soil. One of compost’s primary purposes is to add to and build a beneficial population of soil microorganisms. In fact, a number of growers I’ve known will deliberately use compost for that very purpose as their primary goal. Any nutrient content delivered with the compost is, for their purposes, secondary. OK, so soil is a living breathing community. So what? How does that help plants? At this point we have already begun to diverge from conventional ag methods which simply provide nutrients, and get into the sustainable farming portion of the conversation. Compost introduces microorganisms, and those microorganisms in turn begin to work on digesting various materials present in the soil. That digestive process does two things - it liberates nutrients for plant use, and gives the soil better water-holding and aeration characteristics. Let’s take a closer look at those processes. As hinted at above, soil is much more than a three dimensional matrix to support and feed roots. It is one part the shattered pieces of whatever parent bedrock lay underneath. It is one part the shattered pieces of whatever soils, stones or large rocks have washed down from other locations, or been deposited there by previous flooding and/or glacial activity. It is a continuously changing reservoir of water, which ebbs and flows according to the seasons, the underlying water table, the movement of soil and surface waters in the area, and precipitation. And soil is, at the end of the day, a repository of all the life that has gone before - the plants and animals which have lived and died in that location over time. A graveyard, if you will, for all those previous generations. And here is where our population of microorganisms pay their way. All those geologic, hydrologic and biologic materials contain a wealth of nutrients. But how to get at those nutrients? Sadly, some of those nutrients (many soil scientists would argue that MOST of those nutrients) are chemically and/or physically locked to the inert substances in the soil, due to a variety of chemical and physical bonds. We won’t get into that level of detail here. Suffice to say that without microorganisms to break down those bonds and free up those nutrients, our plants would never have access to them. Yet introduce those hungry little microorganisms and their various digestive processes, and voila! Their waste products (you could think of it as microscopic poo) become the water-soluble nutrient solution that our plants take up in their roots. Let’s be very specific here. If compost did not contain any nutrients at all, but merely provided a goodly volume of beneficial microorganism populations, it would still help feed our plants. Why? Because the microorganisms would digest large soil particles and free up soil nutrients, which would otherwise be unavailable to the plant roots. Many would argue that process by itself is what makes compost so valuable. But wait, there’s more. Compost DOES contain nutrients, sometimes a great deal of nutrients. And those nutrients go into the soil and become available to the plant roots at various rates throughout the growing season. First and foremost in most people’s minds is nitrogen. It is a cruel irony that our atmosphere contains a preponderance of nitrogen, yet nitrogen is the nutrient needed the most, yet it the priciest nutrient to provide to our plants. Many consider compost an excellent source of natural nitrogen, and for good reason. Adding to the cruel irony is that nitrogen is abundantly available in both plant and animal wastes, but it is so easily mobilized in the air, in water and in soil that it can be lost before we’ve had a chance to use it. When we talked last time about the ideal carbon:nitrogen ratios in compost, there were two main reasons for really focusing on that particular ratio. First, most microorganisms need a certain mix of carbonaceous and nitrogenous materials in their diet to be happy. If one ingredient is either lacking or in surplus, the microorganisms can’t metabolize their meals as efficiently and the whole process slows down. But if we tweak that ratio just a little to either side, we can preserve most of that efficiency, and more closely start to match up what the compost can provide versus what our soil actually needs. For instance, if our soils are already rich in nitrogen for whatever reason and we merely want the benefit of boosting the microorganism populations, we would want to go a little heavy on the carbon fraction of the C:N ratio. That way, the soil’s excess nitrogen would be bound up with the incoming compost and then brought into that ongoing digestion. That situation presents itself when soils are at the receiving end of upstream nitrogen-heavy discharge, for instance from feed lots or fertilizer-heavy irrigation sources. If the nitrogen isn’t captured and sequestered, it will simply continue to move downstream where it can cause things like damaging algal blooms in either fresh or salt water bodies. But a carbon-rich compost application can tie up that nitrogen, keep it from washing downstream, and make it available to subsequent crops. On the other hand, if nitrogen is lacking in the soils, a slightly nitrogen-heavy C:N ratio in the compost will ensure that some nitrogen is immediately available to plants after a compost application, while the bulk of nitrogen is bound up and released more slowly. Other nutrients are also released by compost, depending on what ingredients went into the compost. Macronutrients such as phosphorus, potassium and calcium can all be ingredients in compost depending on how plentiful these nutrients were in the starting materials. Happily, the same general principles apply for these other nutrients as with nitrogen - most of the nutrients will be available for long-term release into the soil as the microorganisms digest those parent materials. But a bumper crop of one or more nutrients may be available right away if present in sufficient quantities in the parent material. The same holds true for trace elements as well, and here’s where making your own compost can start to really pay dividends. Once growers have the basic composting process figured out and established, they can start to customize their composting activities to provide extra ingredients as needed by their particular soils. For instance, selenium is deficient in many areas with plentiful precipitation. Those growers who also raise feed crops either for their own livestock or for sale, may want to introduce selenium to the soils since selenium is required by all classes of livestock for healthy musculature growth and performance. Or perhaps growers want to introduce a group of elements, via materials such as rock dust, to tired soils. Those ingredients can be applied separately, per a soil analysis recommendation. But when farmers and ranchers start looking at multiple passes over the same field, applying different specific chemicals, at some point they start to ask if they can combine those applications into one trip. Yes, they can, if those ingredients are in the compost they’re already applying. So, compost introduces microorganisms to the soil, and nutrients to the soil. What else does it do? Remember when we mentioned above that compost will help soils either hold water or drain water? How does that work? Let’s go back to looking at what soil is actually made of. Most soil scientists would start with the parent geologic material - the sands, gravels, silts and clays that have weathered over time into that location’s soil. But we also know that soils are made up of all the countless generations of plants and animals that have lived and died in that location over time. That introduces a wide variety of additional materials, in various states of decomposition. Add to that the current generation of life at that particular location and you have a soil that has some measurable ability to hold water. Add to that the locale’s climate, and what the grower is trying to grow. It’s a rare thing that a grower would coincidentally have a soil that happens to store or drain water at exactly the right pace for the desired crops, in that particular climate. Most of us want to tweak that a little, by either speeding up or slowing down the drainage rate. For instance, our first property was on the high plains of the American West, where soils are typically very sandy, rainfall is sparse, and the biomass of previous generations is relatively lacking. We added compost to that soil to increase the water holding ability and boost the organic content of the soils. Water wouldn’t drain through quite as fast, and we had better water retention for our thirsty plants in those hot, dry conditions. But when we moved out to the Pacific Northwest, we were in much different conditions. Our soils are a mix of silt and clay, with a tremendous amount of forest litter deposited over countless generations. At our rental land, we have all that plus the deposits from countless previous floods. Those ingredients make for a very heavy soil that doesn’t drain nearly fast enough, and is very prone to compaction. Instead of craving water, our plants are at risk of drowning and/or suffocating. Plus, our soils are relatively cold. Here, compost introduces enough undigested biological material that the actual air spaces are opened up between each microscopic plate of clay, and each bit of silt. The compost’s microorganisms re-inoculate the soil each season when the previous year’s microorganism populations may have slowed down or drowned out over the winter. Our soils come awake faster, we have better nutrient availability, and better digestion of the muck from all those countless generations. In that regard then, compost is the great equalizer of soils, helping to heal whatever imbalances there may be so that productive growth may be optimized. This has been another long tour through the realm of compost, but we’re not quite done yet. Next time, we’ll look at when to apply compost, how much to apply and how to ensure your particular compost is providing what your particular soil really needs. Thanks for continuing to read and hang in there - compost is worth this long hard look. Image courtesy of WSU Extension and the Compost Education and Resources for Western Agriculture project, funded by the USDA SARE program. Composting is widely regarded as a good thing to do, and compost is widely regarded as a good product for the farm and garden. It’s manufactured by countless people and companies, at scales ranging from a single bin on the urbanite’s deck or porch, to acres of windrows at commercial facilities. It’s purchased by the bag and by the ton by both farmers and gardeners to boost soil nutrition. There’s 101 designs for farm and garden composting systems, some more elaborate than others. Agricultural extension offices hand out flyers and sometimes equipment to help get folks started with composting, and land grant universities teach workshops and classes on various composting methods. It would seem that composting is one of the few topics everyone can agree on - it’s wonderful stuff, it makes good use of what would otherwise be waste, and there’s steady demand for it. So, what else is there to know? Plenty, it turns out. Composting is one of the most popular, yet most myth-ridden practices that are in common use for current farms and gardens. I’ve been wanting to take a look at some of those myths, at the facts behind them, and what changes might be made to get the very most out of your own composting practices. Or, if you don’t compost yet, get you started on the road to composting success. While researching this topic, I found so many different myths about composting that I very quickly had much more than a single blog entry could accommodate. As a result, I’m going to use this first entry as an introduction, then feature ongoing myths and facts about compost ingredients, processing and usage. So, let’s get started with the introduction. Later we’ll cover some of those myths. “Composting” as the term is used today is a process. Very generally speaking, that process is simply the breakdown of complex organic materials, either plant-based or animal-based, into other substances which collectively improve the soil. That breakdown is accomplished primarily by a wide range of microorganisms, primarily bacteria, but may also include fungi, small insects and invertebrates. That breakdown process can be categorized as either aerobic, or anaerobic. Aerobic bacteria work in the presence of oxygen, but anaerobic bacteria work in the absence of oxygen. While other on-farm processes (such as silage-making or bio-digesters) involve anaerobic bacterial processing, virtually all soil fertility-boosting composts are made aerobically. Composting can be used to break down and recycle a wide range of materials, including animal manures, animal carcasses, weeds, some types of diseased plants, small branches and vine trimmings, and post-harvest materials such as stems, seeds, pith, roots, whole potted plants, skins, bones, hooves, and internal organs. On a smaller scale, composting is very successfully used for household paper, kitchen and yard waste. This wide variety of input materials can have a very pronounced impact on the composting process itself, along with the resulting product. Regardless of the starting ingredients, aerobic composting is generally measured with only a few different variables. First and foremost is the ratio of carbon to nitrogen. That ratio can only vary by a small amount, and even variations within that range will result in different attributes for the finished material. The ideal generally listed for compost is a ratio of 30:1 C:N, which means 30 parts carbon to 1 part nitrogen. Sometimes that is expressed in weight, other times in volume. Unfortunately, most of us don’t have the ability to instantly determine what C:N ratio any given material has. Thankfully, there are some rules of thumb we can follow. Carbonaceous materials include most woody materials, paper materials, rags and fabrics. Nitrogenous materials include manures, urine, blood, any animal materials, and fresh green materials such as grass clippings. There are a number of published lists available, showing the C:N ratio for a wide variety of common ingredients. They are listed in the Resources section at the end of this blog. A second critical variable is particle size. The smaller the particle size, the faster the material can be acted upon by the composting microbes. The larger the particle size, the more time it will take to break that particle down to smaller sizes and then act on the substances within. Many practiced composters will sift out near-term compost to remove the larger chunks. The finer materials are finished and ready for use, while the larger chunks are simply added into the next batch of compost. The third criteria to consider is moisture. As with C:N ratio, the exact moisture can be inconvenient to measure directly but some educated guesses can be made. The ideal overall moisture content for the composting pile is 40% to 60%. That is approximately the moisture of a wrung-out sponge. You can feel the moisture, but it’s not dripping. If the pile is drier than that, the aerobic microorganisms won’t have enough moisture to do their work. Conversely, if the pile is wetter than that, the moisture can drive air out of the pile, thus turning it anaerobic. Conveniently, moisture is relatively simple to adjust. If the compost pile’s main starting ingredient is wetter than desired, the compost manager can add dry materials to even out the moisture content. If the main ingredient is too dry, the pile can be watered either as the new materials are added, and/or throughout the composting process. Given that so many materials can be used in compost piles, and that each has a different C:N ratio, size and moisture content, how does a wannabe composter put together a workable compost pile? Here again, there are a number of recipes and approaches available. One popular approach is to layer carbon-rich materials with nitrogen-rich materials. Each layer would be at most a few inches thick. This approach works well if small amounts of material are being added at any given time. The carbonaceous materials are generally added first and last, sandwiching the nitrogenous materials inside. Another approach is to mix the starting materials in a bucket or cement-mixer, then adding the mix to the pile for a uniform, correct-ratio starting pile. A third approach, particularly for larger operations, is simply to put the new materials into an existing pile, then turn the pile or bury the new materials right away. This level of compost-making is often done with a front-end loader or other heavy equipment, but the same principle applies on a smaller scale with large volumes of new material. More detailed recipes are provided in the Resources section at the end of this blog. These piles are stored in a very wide variety of shapes and containers. Home-scale composting containers might simply be a few small bins. 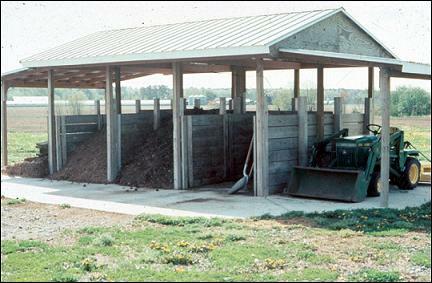 Small scale farm composting might be a few 10x10 piles, contained by cement blocks or other infrastructure. Here again is another rule of thumb to remember. Composting needs a certain critical mass to create and sustain a suitable temperature for aerobic digestion. That critical mass can be provided via a cube shaped container of roughly a meter or yard’s length on each side. So for instance, a cube measuring 1m long by 1m wide by 1m deep would be the minimum volume needed to allow for the composting process. Larger piles can work quite well, but still must be sized to be appropriate for the volume of incoming material, and the volume of outgoing compost. The compost piles must also reflect how the compost manager will work with the pile. If that means using hand tools such as shovels and rakes, then 1-2 meters on each side is generally big enough. If the compost manager has access to power equipment such as a front end loader, the piles can be bigger and deeper. Another good rule of thumb is to consider how to set up the composting area for maximum efficiency. Generally speaking, most compost masters recommend having three piles - one being built, one digesting and one which is finished and ready for use. Whatever the arrangement, covering the compost piles is definitely in order, to keep rain and snow off the pile. The time needed for any given composting process doesn’t vary much. Under ideal conditions of 30:1 C:N ratio and 40% to 60% moisture, the compost pile will begin heating right away, and reach near maximum temperatures within 5-10 days. That high temperature, typically around 160F, will then last for approximately 20 days, at which time the pile will cool off and stay cool from that point forward. When the overall nitrogen content is relatively high, composting temperatures go higher, but don’t last as long. When overall nitrogen content is relatively low, composting temperatures do not reach such high temperatures, and like the relatively high nitrogen pile, the temperatures do not last as long. It should be noted that most weed seeds and disease organisms are killed at those higher, longer-duration temperatures. That is one of the major reasons to strive for an ideal C:N ratio. Organic certification rules reflect that, with a stipulation that compost piles must be at 150F for at least 15 days before application on the fields or growing areas. This is very definitely only the tip of the iceberg for composting knowledge. There is much more to come, I promise. If you’ve read this far and want to read more, here are a range of reading materials for you to peruse. In the meantime, I will continue writing up additional composting entries to be added to the blog in the coming weeks. We hope you find something here of value for your own home, garden or farm. My father-in-law as a young child, in the wagon with his brother, sister and father, doing chores on the ranch outside of Ola, Idaho, approximately 1940. As the above quotes indicate, this nation was once proudly and capably carried by sustainable agriculture. Which in turn was competently and efficiently powered by animals - horse, mule, ox. All that changed after World War II, for a variety of reasons. Some would say it was simply the steady march of progress. Some would say that we finally had the industrial infrastructure in place to mass produce enough tractors to meet growing demand. Some would say farming families were anxious to entice their young war veterans to stay on the farm during peacetime. Some have claimed it was a deliberate, calculated attempt by industry to supplant self reliance in favor of dependency upon purchased goods. Whatever the factor(s) at work, it took only 15 years, from roughly 1945 until 1960, to make that conversion nearly complete. In the late ‘50’s, most figured that animal power was no longer a relevant option for American farms. But during the early 60’s, something changed. I don’t know if anyone has ever nailed down the exact detail, event, or combination thereof. But enough folks either started to wonder if perhaps we gave up too much in those post-war years, or that perhaps tractors really weren’t as satisfying an answer as first advertised. They began to look back at how things were done in years gone by, and ask if perhaps those solutions might still be relevant. And apparently quite a few of them made the choice, partially or fully, to bring draft animals back onto the farm. That development began quietly, even secretly, les the neighbor or the townspeople or the family members learn of what was surely mere folly. But those folks laughed all the way to the bank as fuel prices continued to climb, parts and service got more specialized and more expensive, and the promise of cheap fuel burned out. The most current numbers available, and it’s a hard number to calculate, say that approximately 400,000 people in North America are using draft animals today as part or all of their farm equipment power source. Yet a stigma still exists that this is simply nostalgia, a refusal to get in step with the smarter modern way. Those who express an interest in pursuing animal power are carefully advised to get over such silliness and get back to work with accepted tools. Why do I wax poetic and passionate about this topic? We have been searching for years now, for some form of efficient, reliable, sustainable on-farm power source. And we’ve been more and more disappointed in our search. Manual tools and two-wheeled walking tractors were of course cheaper, and for some tasks were absolutely the most efficient for our small operation. But what we saved in money, we lost in time and effort required. The busier we got, the less acceptable that was. When we expanded our search to include tractors, we seemed to have a choice between spending too much for a newer machine without issues, or buying an affordable machine with either known or strongly suspected mechanical problems. We did find a few tractors along the way which seemed a good compromise between mechanical soundness and affordability. But negotiations never quite yielded a mutually acceptable deal. Our search wasn’t urgent in previous years since we were either working on a small scale, or working on other farms with their own equipment. But it came home to roost this year when we realized our rental pasture was spectacularly productive, if only we had scale-appropriate equipment to harvest it. At that point, we realized we were burning money to let that grass go to waste. So we began working the numbers in earnest. Would a tractor really be the best way to make the most of this new, larger crop? Or, do we dare join ranks with those who have committed to using draft animal power on the farm? One rainy weekend this past summer, I sat down with all my receipts, all my projections and all my research, and started crunching the numbers. Given the land that we rent, the productivity of that land, the grass hay we consume and the hay we could harvest, the numbers were clear. 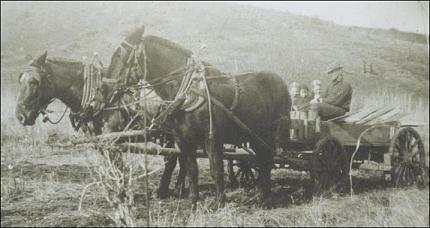 At present acquisition, fuel and maintenance costs for either horses or tractor, the horses won by a nose. That was assuming that we used them solely for hay production. If we expanded our analysis to consider other power needs, the numbers favored horses even more strongly. And considering our existing use of, and need for, composted material for the market crops, the numbers improved again. This was no trip down nostalgia lane. This was, at least on paper, a sound decision. But I felt compelled to continue checking. Perhaps my analysis had been skewed, or faulty, or lacking in some way. Someone else must have done similar comparisons; did they find the same thing I did? A Google search on “animal power versus tractor cost analysis” yielded some interesting results. A Swedish study compared the cost effectiveness of animal power as used during 1927, compared to the cost effectiveness of tractor power as was typical in 1996. In that comparison, the study found that farmers saw a 13-fold increase in external energy inputs on the farm during that time interval, with only a 2.4 increase in farm productivity. That study also found that 60% of the horse power inputs were renewable, while only 9% of the tractor inputs were renewable. Furthermore, that study summarized that a decrease in availability of either fuels and/or minerals may drive a return to animal power in that country, and not merely in the agricultural sector. An American study done between 2000 and 2005 found that a 40-year career of using horses resulted in a net income of just over $21,000, in addition to whatever crop income was produced with those horses. During the same timeframe, a farm using tractors would have a net cost of $70,000. In other words, there was nearly a $100,000 difference over 40 years when comparing tractor use with horse use, with horses not merely cost effective but profitable to use. Anne and Eric Nordell have written a column for the Small Farmer's Journal for many years, during which time they have chronicled the practices and performance at their horse-powered farm. Their uses of horsepower has allowed them to not only work the fields cost effectively but also stay out of debt. So where do we go from here? We have a demonstrated need for some bigger energy source than what we currently have. And we have renewed our pasture rental for 2012. If a suitable tractor materialized on our doorstep, would we use it? Perhaps. In the meantime, we have three fit Morgan mares with an admittedly skinny list of to-do items on their daily schedules. So we have decided to move forward with making the most of what we have at hand, rather than holding out hope for some miracle deal. We certainly have a lot to learn about how to get into this teamster gig as safely, as competently, and as cost effectively as we can. Towards that end, yours truly is currently working with different trainers to get my own skillset honed and sharpened for what lay ahead. I have driven teams in the past, and I have trained horses in the past, but I’ve never combined the two. Nor have I the sheer volume of experience I’d want to have to do this on my own. But the decision has been made. We’re tossing our proverbial hat into the draft animal ring. We believe that our farm’s sustainability is best served by that choice, and we’re investing our time, money and effort now into making that choice a reality. We’ll keep you posted on our progress.